Zoom Get a closer look - zoom in quickly and accurately with the intuitive Zoom feature. Customizable Hot Keys Perform common tasks, like opening documents and replying to e-mail, with the touch of a button. Improved Number Pad Commonly used symbols such as equal sign, left and right parentheses and "Backspace" are in quick reach, just above the number pad. 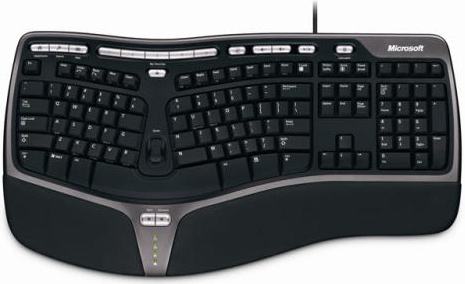 Ergonomic Design Type in total comfort - ergonomic design encourages natural wrist and arm alignment so you can work without discomfort. Device Stage Quickly and easily access common tasks, including product information, registration, settings and more for popular devices such as cell phones, cameras, printers,and mouse, keyboard and webcam products. Internet Hot Keys With the touch of a button you can quickly access the Internet. Taskbar Favorites Easily access programs in the taskbar with convenient keyboard hot keys. Applications can be easily rearranged by clicking and dragging and the keys will automatically adapt to the new location. Email and Internet Hot Keys Touch a button to quickly access e-mail and the Internet. Multimedia Keys Quickly and easily access and control all of your media from your keyboard. Lockable F Keys Lock your F keys to avoid engaging them unintentionally. Integrated Palm Rest Get better support with this plush, integrated palm rest. Cutting Edge Design Whether you`re at work or play, improve your performance with cutting-edge Microsoft technology. 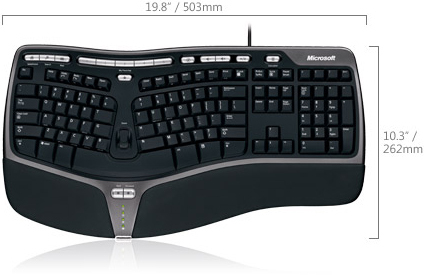 Really comfortable to use, and reduces stress on wrists.